The Page or Knave of Swords normally stands proudly but hesitantly holding a sword while looking either towards or away from the action. As a person, this Page is normally young or new on their path. Pages are messengers and the Swords are our cards of logic, cool heads, mental health, and recovering from oppression or trauma. Writers frequently get a lot of Swords court cards, as do doctors, mathematicians, and scientists (to name a few). The Page of Swords then brings new insight or clarity to a tense situation, illuminates new ways of healing or coping, or brings a new type of thought and energy into a situation. The Swords cards are action oriented once we have a plan, so this Page is also ready to wield that Sword, so long as they know what they’re doing. As advice, you are likely being called to be a person who brings fresh thought and critical planning into a situation, or perhaps you’re being told that you have a plan already so it’s time to take charge and act. 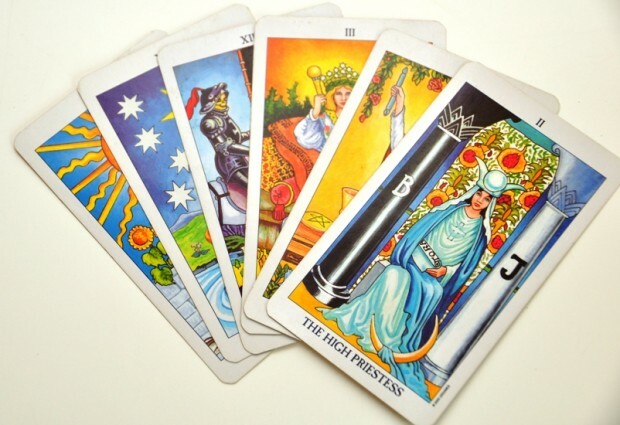 As an event, it is likely that you are entering a period of new ideas or insights into your own life right now, or that this is a period where you’re learning a lot of new information. The Page of Swords is critically honest and forever curious about the “why” of any given situation. All of the Swords court cards represent a time to cut out or cut off negative habits, relationships, or situations. The Page is a good bit kinder than the rest of these court cards, so if that’s the message that comes through in a reading this is likely a mutual decision, or a habit that’s died off already and now it’s time to embrace it, or it’s something you can gently ween yourself off of. The Page of Swords has shown up a lot of for me in tarot pretty much since I started my journey in a dusty dorm room basement a decade and a half ago. Quite frankly, once I realized I was queer, this card showed up again and again and again to push me to just get it over with and come out. I’ve seen that be true for several other clients. Even if one is already out to the world at large, this card indicates a need to come out at work, to your grandparent, or wherever that hole in honesty lies. The Page is not a negative card, so it’s safe to come out now. Alternatively, the Page of Swords speaks a lot to sexual and gender fluidity. Many of us come out as one thing, with a specific understanding of ourselves or our identity. As that shifts and evolves, the Page of Swords will show up to urge you to live your truth, however fleeting or confusing that truth may be. Words are important to Swords cards; there are many other cards that deal with fluidity where you don’t have to call yourselves anything, but with a Page of Swords, labels can be affirming and freeing. This card does then urge you to seek a label that fits your current experience. As your sexual identity shift and grows, the Page of Swords will probably show up each time as that annoying tough love friend, promising you that all of this was safe to feel, discuss, and live as, but pushing you to accept yourself in all of your various iterations. This card will also call you to actually face any changes you’re going through, instead of running or doubling down on labels or identities that no longer fit you. While Wands deal more directly with social justice action than I often see the Swords as doing, this Page is a call to action. We’ve spent this whole suit dealing with oppression, and we spent the Wands suit learning to harness our fire into something actionable. Now this Page of Swords shows up to ensure us that all of this planning has paid off, and we are ready to pick up a Sword and fight. This is most likely a head-on battle. The Swords do represent law, medicine, etc. This is not fighting from within or trying to create change while also holding a job in one of these offices. The Page wants you to prep for a battle, you versus the person or organization you’ve been struggling with. You are ready. We’ve talked a lot about the Swords in regards to mental health and healing from trauma. This Page brings a kind but urgent cool-headedness as you realize it’s time to bring in a professional to help you through your next stages of healing. You need psychological insight that doing the work on your own will no longer provide, but you’re also ready and feeling equipped to doing the deep dive that any good therapist will require of you. It is not only spiritually safe to move to another plane of coping or healing, but it’s emotionally safe to dig in deep and allow for third party insight. In some cases, this card could indicate that medicine for your mental health is needed now. You’re either starting a cycle of mental illness again or are coming out of one, and a Page of Swords shows up because they just want you to feel better this time around. As we look at the world around us right now, it’s so easy to feel completely overwhelmed and frustrated. So many of us are dealing with really deep cases of compassion fatigue, disassociation, or blatant exhaustion from trying to handle everything. The Page of Swords also seems to be evolving to adapt to these times. I’m seeing people who have never struggled with mental illness before needing therapy or to learn coping mechanisms. I’m seeing some of the most well-balanced people I’ve ever met start to spin out. These are difficult, trying times. The Page of Swords shows up to remind you of the reality of the situation, both good and bed. Yes, this oppression that the Swords often deal with is very real. It’s not all coming from institutions this time either; homes are being destroyed from natural disasters and we are left literally picking up the debris, often without the aid of the places we are supposed to trust to help us. The Page of Swords is not going to lie to you about the reality we are facing. However, the Page of Swords does bring a new view. Part of queering anything is learning alternative ways of existing, loving, and thriving. If we can’t rely on a government agency to offer an opportunity to help, we can find a new way to aid those in need. We can form a new organization, send what’s needed to individuals we know how to reach, or get together to brainstorm totally new ways of putting our passion into action. Ultimately this is what the Page of Swords wants us to do, and it’s what too much of the world needs from us now. The old ways are broken, and they might not be fixable. Find a new way. Be a new way.